Are You Ready to Finally Learn How to Make a Website? I think we can all agree that having your own website is vital when you are trying to establish your brand. Whether you’re a small business owner or simply want to keep a blog for fun, websites provide an easy way for customers and fans to reach out and find out more about what you have to offer. But it’s not always easy knowing where to begin. It can even seem overwhelming at times. As it turns out, learning how to build your own website is A LOT EASIER than you might think. Not only is it actually possible to build a website for free, but you can build one with virtually no coding experience. A quality website provides an experience focused on a specific message. This message is something you need to think about before you even design a single page, create content, or select a name. You need to understand what your goals for the site are and use those goals to guide all future efforts. If you are interested in selling a product, then that is the message your site should focus on. To support that goal, you will need a site designed to support eCommerce. By comparison, a site dedicated to sharing information doesn’t need functions like a shopping cart. Instead, you need to be able to post and organize your information in an attractive manner. You may also need multiple methods for sorting the content and making it searchable. Once your priorities are set, you can move on to the next step of the process. Your website is only as strong as its content. Whether that is product pictures and descriptions, blog posts, news articles, or cat videos, you need to know exactly what you have and how different pieces of content can fit together. You can then use that information to envision how you would like the pages to look and how the content will be displayed. If you are truly a beginner, you may want to look at sites that will serve as your competition and figure out not only what they do right, but more importantly what they do wrong. If you alleviate the pain points of another site, users may flock to your site instead. The great thing about the internet is the constant struggle for creating the best content. While others compete to have the best websites, the end user is the one who benefits. You don’t have to understand any of this from a technical standpoint. This part of the process is pure design and inspiration, but it is critical for moving on to the next step. Website builders allow you to create your own website based on your preferences. A variety of software solutions are available on the market today and they are aimed at designers with a wide range of skills and understanding of the web development field. Website builders have been around for years, but the modern builders are so powerful that one might have trouble distinguishing between a site created using a website builder and the services of an expensive professional. This is because complicated scripts and add-on features have been made simple. NOTE: What once may have taken a day of coding work to create can now be done with the click of a button. Selecting the right website builder is extremely important because it is the tool that you will use every time you want to make revisions and additions to the content of your site. If a website builder is too complicated, you may put off making changes, hurting your website’s overall performance. Some of the easiest ways to create a website are with website builders that offer interfaces geared towards beginners. One of the most popular options is those featuring drag-and-drop tools. While many people still build websites from the ground up (ie, using code and scripts alone), there are a number of services that will show you how to make a website with simple drag-and-drop tools. Knowing how to make your first site from scratch isn’t something that comes naturally to a lot of people so a number of web builder sites make it easy for just about anyone to build a beautiful site in a matter of minutes. The secret lies in the “what you see is what you get” interface, where you can literally drag elements onto your web page and view your site exactly as it will appear when it is published to the internet. This foolproof system ensures that you will have a beautiful website every time. With website builders, creating your own website is often as easy as figuring out what kinds of extra features you want and letting a drag-and-drop tool do the bulk of the work. The process begins by selecting a website theme. This is the template that your website will use on all of its pages and includes fonts, colors, and an overall design scheme. Website builders offer themes created by industry experts who know how to optimize websites to perform at their best. 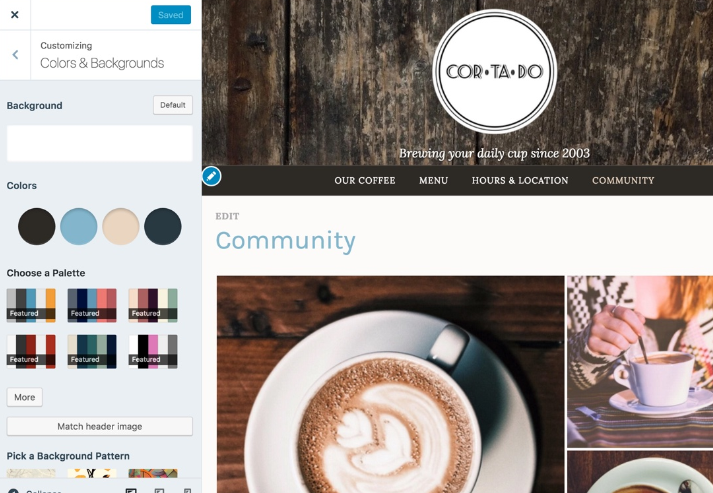 Once you select a theme, you can change your site layout and begin adding content. 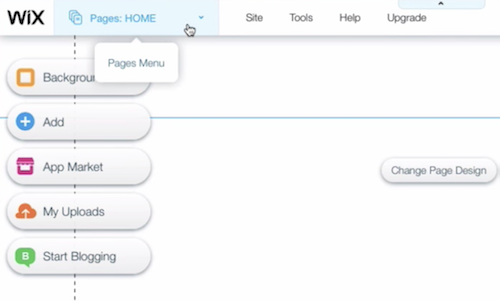 Once your content is up, you can choose from a library of different add-ons available to make your site do more. These include tools for search engine optimization, contact forms, maps, and everything in between. PRO TIP: The important thing is finding the right service for you when figuring out how to build your own website. Some of the more popular services include Wix, Drupal, and Joomla. Which platform you pick depends on how much you know about coding and designing a site. Creating an eCommerce website may seem like a challenging prospect. After all, there are so many considerations you have to make. From inventory management to shopping cart tools and everything in between, it’s an ostensibly overwhelming endeavor. Thanks to eCommerce website builders, however, it could not be easier. The process begins similarly to that of building a personal website. 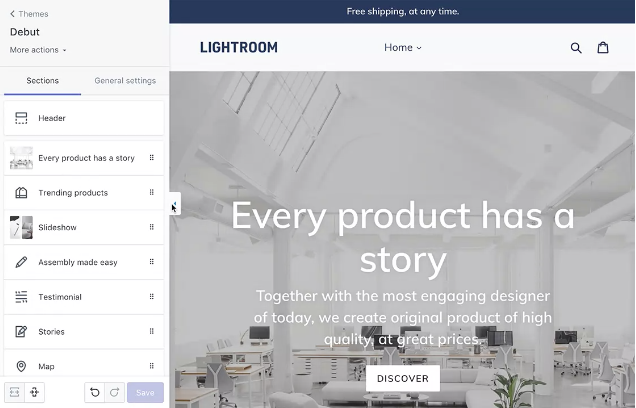 You can choose themes, customizations, and extensions, but you also have the option of adding from a plethora of eCommerce tools. Integrated online store management tools ensure that you can focus on your business instead of a website. Website builders like Shopify perform all of the functions you would normally have to pay someone else to manage for free of charge. Services like automated shipping and tax calculators remove the programming skills that would be necessary for a site built from the ground up. NOTE: Value added features like analytics not only tell you about the customers you have but also about the potential customers you can create. Whether you are a small business or one that already has a respectable customer base, eCommerce website builders can be a good alternative to creating an online store from scratch. Trusted by some of the largest brands in retail, they truly represent the bright eCommerce future. WordPress is an alternative to website builders which relies on a content management system (CMS). Unlike the simple drag-and-drop method of website builders, WordPress uses a more advanced user interface that relies on greater user knowledge and experience. Despite WordPress having a steeper learning curve than the average website builder, many prefer it. In fact, a report by OpenSourceCMS showed that roughly half of all new websites built this year were made with WordPress. The reason for this preference is WordPress is an open-source platform. This means that anyone can create themes, plugins, and anything else to make your website more interesting and functional. Website builders, on the other hand, and generally more closed and proprietary. Best of all, WordPress is free and can be used on any host. Your next step is to find a place to host your website. Most of the drag-and-drop website builders we talked about above offer hosting services built into their tool. Wix and WordPress are among them. But even if you use one of these services, you don’t always have to stick with their hosting service (though if you choose to move elsewhere, you may need help migrating your site to a new host). There are many services out there, such as GoDaddy and Bluehost, which allow you to host your website. Of course, you could host your website yourself if you have servers and the technical know-how, but we don’t recommend it if you have limited resources. By having someone else like GoDaddy host your site, you will be able to keep your site online and receive support when needed. Many services will also offer free domain names. Many hosting services are inexpensive, often costing less than a cup of coffee every month. Knowing how to make your own website is one thing, but knowing how to host a site is a much more involved process. Picking your own domain name is key. This is, of course, the name of your site and how customers can find you online. Ideally, your domain name should be the name of your business (or even your own name if you are making a website all about yourself). Most domains end with .com, .org, or .net but there are other domain extensions out there. Make sure if you do use a domain extension that it is one which you can easily remember. Having your own domain, as opposed to having a domain through another service, not only looks professional but it enables customers to more easily find and interact with you. You will typically be able to have your own email address with your site’s domain, which will look considerably better versus having an address like “example”@gmail.com. To do this, make sure that your hosting service offers email. Not all web hosting services are created equal and so it’s always worth doing extra research to find a host that offers email and everything else you need to run your business or brand as smoothly as possible. When considering how to create your own website, you like gave some thought about finding a great domain name, or even naming your website. But, when it comes time to choose, you may find that you aren’t as in love with the name, or that another site already owns the domain you wanted. While this can feel like a major setback, it doesn’t have to be a major hurdle. To help you choose a name, here is a process for getting a new name nailed down. First, you need to name your brand. If you are already selling a product or service, this step may already be done. However, if you are creating a venture from scratch, then this may still be on your to-do list. You should think of something creative and original, but you don’t want to choose anything that would be a stretch to associate with your website. It may take some research, but it is well worth it. Next, when exploring domain names, you want to pick something as close to your brand name is possible. And, in an ideal world, it should also be short. You want it to be memorable and something that people can easily type to get to your site. This should always take priority over getting keywords into a domain. While keywords are helpful, they aren’t everything. When choosing an extension, see if a .com version is available. Though some people think this is a mistake since it is so highly used, it is often the first thing a potential customer will think of. As mentioned earlier, when building your website, you will be required to select a theme. A theme can tell your visitors a lot about your site, so you should make sure to choose carefully. Themes come in all shapes and sizes. They can be minimalistic and simple or bold and colorful. Although there is no right or wrong, it is advisable to stick to a theme that matches your website’s general feeling. If you are promoting a business, for example, you probably want to make sure your prospective clients get a good impression. A responsive design ensures that your website will look good on any device. Whether your visitors are accessing your website on their laptop, tablet, or smartphone, your website will automatically conform to fit the screen without becoming distorted. We once believed that DVDs were the sharpest picture we could get. Then BluRay came along and made us truly appreciate a high-definition image. Now even BluRay is looking pretty grainy compared to 4k and 8k video. Websites work in a similar way and finding a template that is “retina ready” is important if you want all of your users to experience the highest quality version of your site possible. Text is essential to a website, but, let’s face it, sometimes it’s nice to just look at the pretty pictures. A template that focuses on media is ideal for ensuring your content shines. When choosing your theme, make sure that you select a design that enhances your text. BONUS: To Blog, Or Not To Blog? The internet acts as a public stage for you to share your thoughts and ideas with the rest of the world. One of the most popular mediums online is the blog. Blogs enable writers, photographers, and budding filmmakers to share their work online on a simple and easy to manage platform. If you have ever considered creating a blog, you have probably appreciated their potential power. If you have not, we are here to convince you that a blog is a worthy addition to any website. 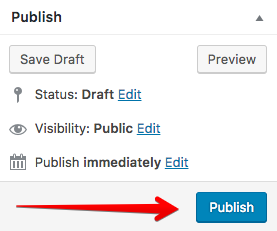 Adding a blog is easy. Most website builders allow you to add a blog with a click of a button. They also include the tools you need to add new blogs with ease. It’s good for marketing. One of the main benefits of blogging is that search engines love content. If you create great articles, you may just find your site ranking for keywords that will drive viewers and even customers. It makes you knowledgeable. Writing about anything has the added benefit of enhancing your knowledge about the subject. Before long, many bloggers find themselves becoming authority figures and experts in their fields. It informs others. Aside from increasing your knowledge, blogs have the power to increase the knowledge of other. This can be a powerful position to be in. It can be lucrative. Many bloggers earn money through their blogs either directly from sponsorships or through ads. While you should not expect earnings from an eCommerce blog, there is nothing wrong with placing ads on your personal website. We highly recommend adding a blog to every new site you create. There are so many good reasons to do so and virtually no reason not to. 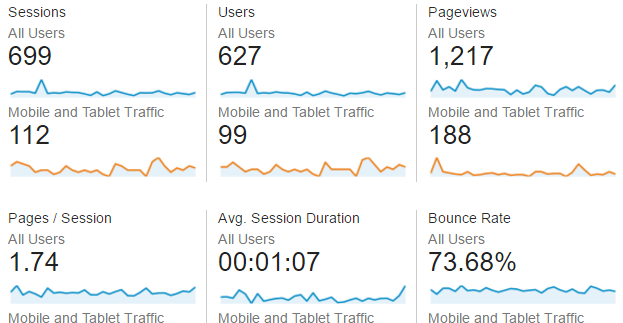 Analytics are an integral part of building a website. Not only can they inform you about how many people are viewing your pages, but also about specific data about those visitors that you can use to target more or fewer like them. When first starting out, you may feel like you have a good general idea of who your audience is and how they will reach your site. Analytics can expand this idea and even provide insights into untapped markets that are relevant to you. Keyword data provides you with all of the searches that drive people to your site. If you decide to increase your scope, this data can also give you an indication of how successful you are at acquiring a new audience. Customer insights are important if you run an eCommerce store. Analytics tell you a lot about the people who come to your store, how long they stay, and what they click on. This data is extremely valuable when considering how you can improve your website, and can even be used to test the effectiveness of different features. These insights can also be relevant to personal websites. If your portfolio site is targeting a specific audience, for example, you can keep tabs on your analytics to see if that audience is reaching your site and using it as you intend. The measurement known as bounce rate can be specifically helpful in understanding how people interact with your site. Bounce rate refers to the percentage of visitors who leave your site after viewing only one page. A high bounce rate can be an indication of a poorly laid-out website or even one that users don’t find compelling enough to remain on. It is easy to sign up to a service like Google Analytics and adding your site to their tool can be done in one click on most website builders. Alternatively, you can add a simple piece of code to your site header if your website builder does not offer the service directly. Once you have completed building and designing your website, you can publish it online for the world to see. Over time you may feel compelled to change things or even start fresh. A website is a living, breathing thing that takes a lot of effort to refine and optimize. With time you are sure to become a pro, but until then, keep seeking out more knowledge, read our oft-updated site, and never be afraid to take risks! Knowing how to make a website can be a lot easier to understand than you might think at first. Get out there and start building! I'm a web developer & blogger enthusiast, helping novice users with the principles of site creation. When we started our online journey we did not have a clue about coding or building web pages, probably just like you. All we wanted to do is create a website for our offline business, but the daunting task wasn't a breeze. After months and years of trying out CMS's and different website creators, we became experts in creating these, and wanted to share our knowledge with the world using this site. We now review dozens of web realted services (including dmoain registrars, hosting providers and much more), and write in-depth guides about site creation, coding and blogging. Who can benefit from the site?